Earlier this year I planned a road trip to visit numerous organic farms that sat along or near the same parallel as Emmetsburg (43.1°). This was important because of similar daylight. Sunlight is the primary determinant to plant growth. Growth slows when there is 10 hours or less of sunlight/day. So the trick is to get your plants started early enough so they are close to maturity by that date in winter. Vermont is at the 45th parallel similar to Emmetsburg. This would give me an indication as to what vegetables could be grown at our latitude as daylight has a significant affect on plant’s growing season. Running on a tight schedule, I crossed the country from east to mid west. The following field report covers my first visit with Pete Johnson in Craftsbury, Vermont and his organic enterprise, “Pete’s Greens”. Uncle Hunter sent me an article from the Christian Science Monitor about a this organic farmer, Pete Johnson, who had an organic vegetable farm in Craftsbury, Vermont. What surprised me was that Pete was growing lots of vegetables in the dead of winter, in a sparsely populated area and selling out everything he could grow. 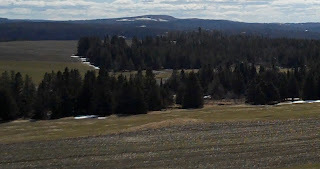 Craftsbury and Emmetsburg are within approximately one degree latitude of each other (Emmetsburg: 43.1° and Craftsbury: 44.6°) thereby getting the same amount of sunlight year-round. I know how cold Iowa winters can be and I wanted to know how Pete could do this. Was it possible Soper Farms could do so as well? 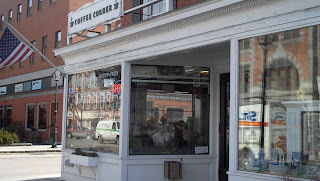 On my way to Pete’s I stopped in Montpelier (state capital of Vermont with about 8,000 population) to get directions to Craftsbury. The folks at the Coffee Corner were very helpful with directions. As I made my way up into the hills I noticed that the ground was not Iowa-class … a lot of exposed granite with thin layers of soil scattered about. 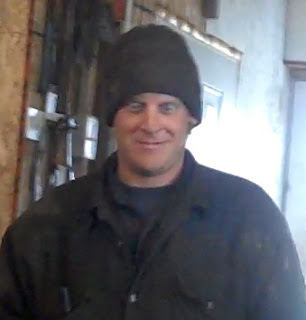 When I found Pete he was at work on a chilly day, doing what farmers do. This is what one of his hoop houses looks like from the outside. He has 4 this size. The one below he calls his “head house” because a permanent building is attached where they prepare seedlings. and their chief maintenance person, Steve. 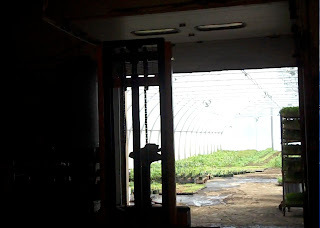 This is a view from inside of the head house looking out into the high wall hoop house itself where they start seedlings and get an early start on spring veggies. Their source for hoop houses is from a Canadian company, Harnois (nice name ditch think?). This hoop tunnel runs 45’ x 144’ and is double layered. The layers are kept separated by a small fan that blows air between then. The logic goes that for every layer on a hoop house you move your site one agricultural zone south. 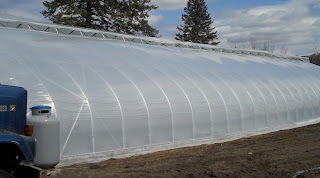 With exception of this head house tunnel, Pete’s other hoop houses are all movable and measure 35’ x 200’. A hoop house is permanently mounted on a rail and can be pulled forward or backwards across the ground by a tractor. This is done at intervals in the planting season. The ground outside is prepared and fortified organically. When the time comes, it is planted and the hoop house pulled over it and into place. This exposes the previous ground to the elements which helps purify the soil with direct sun and freezing temperatures that prevent harmful bacteria that can establish itself in a permanent green house. In the head house Pete and Steve make their own potting soil to start their seedlings. This is less expensive and their plants do better. Pete’s Greens is a certified organic farm. Meg pointed out that you don’t need to use organic manure for mulch on organic vegetables … there just isn’t enough around and organic animal farms will use their organic manure for their own fields. Pete is planning to start raising his own organic animals (chickens, pigs & cows) next year for both the manure and the products. 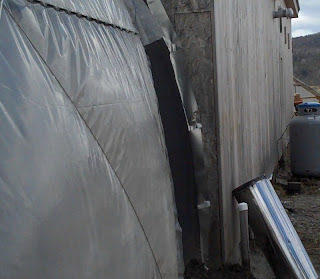 The boiler heats water that runs through the cement slab under the head house and through pipes in the ground under the attached hoop house for radiant heating. They don’t heat the air. Their primary goal however is to not depend on resources that nature doesn’t offer on site. The heating is for special conditions only. To help moderate the heat that can build up in a hoop house with only solar gain heating, there are vents that open and close in the ceiling. 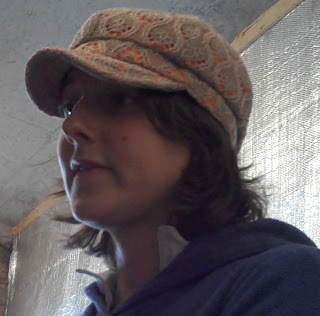 About their markets, they have 200 CSA shareholders in winter, 300 in summer. Pete travels up to two hours away to Burlington and Montpelier. On their Wednesday route they also deliver to their wholesale accounts (restaurants, etc.) and twice a week they have a trucking company (Black River Produce) pick up and deliver to wholesale accounts as far away as Boston and New York. They would like to stay more local but the demand is high. They market directly to their CSA and wholesale accounts which is the responsibility of their CSA Manager. Note – these distances are very similar to those between Emmetsburg and Sioux City and Minneapolis. 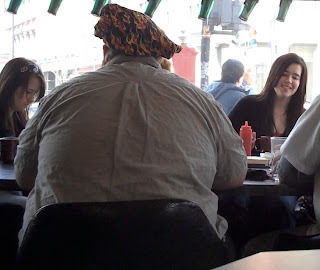 Local can include a pretty wide circle and be profitable. In addition to their own products, their CSA manager is responsible for buying in locavor products (goat’s cheese, eggs, flour, barley, maple sugar, etc.) which they put in their CSA boxes. This is particularly handy in winter when vegetable choices are more limited. Another point of interest about their CSA shares, some but not all of the locavor products they get are organic and their customers don’t care. The customer seems to care most that it is fresh and supports local farmers who practice healthy organic farming practices … but are not certified. Hence the term “beyond organic”. Because all this food is local, the customer can always visit the farm which is hard to do when the veggies come from California, Arizona or Mexico. Pete divides his “share” seasons in 4 parts (spring, summer, fall, winter). A share is purchased up front for the season and averages $44/week. Here in Palo Alto, California a share costs $27/week for a box from JP Organic Farm in Salinas and includes a dozen organic eggs. Pete is also building a commercial kitchen so he can take excess crops and cook and freeze for distribution in his winter share that is dominated by root vegetables. As part of this commercial kitchen, the State of Vermont bought and offered a portable freezing machine that can freeze 600 lbs of anything per hour. To store the frozen products they have a large used trailer they insulated inside with 3 layers of used Styrofoam and sprayed insulation on the outside. Note: If you are selling beef there are FDA regulations that cover meat processing plants. If you slaughter for sale in stores the plant needs to be FDA certified and supervised. If you slaughter just for yourself you can use a “custom” slaughter house where an individual owns the entire cow. If you slaughter on-farm you can sell through your CSA without FDA certification as CSAs are exempt. These regulations are in flux and these details need to be revisited. An important part of their operation is their “wash house” where they wash all their veggies, box them and, for winter roots, store in a big walk-in cooler. I didn’t see the wash house. To add more diversity to their CSA shares for winter they built a separate room where they could put in shelves and grow shoots, radishes, etc. When the season closed they then took out the shelves and used the room for growing chicks until they are big enough to be finished outside. Enter the “roots & chicks” room with Meg. 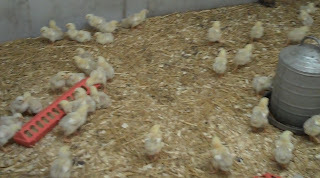 Here are the chicks. These are standard commercial chicks that cost about $1/each. They are cheap to raise … it costs chicken feed (pun). A work in progress – It is clear here at Pete’s Greens, that their business is a work in progress where they experiment, measure and grow. In all the farm visits I have made, I see no “template”, just a lot of flexibility depending on what area of organic farming the farmer prefers and their geographic and climate conditions. In every case, their business was growing. Pete does about $1.5 million a year and he also enjoys the business side of this work. He plans to add cattle, pigs, chickens, more hoop houses with his current growth around 30%/year. Pete wants to grow it to about $5.0 million a year. His CSA customers provide him the cash-flow (they pay in advance) and there is no middle man. His biggest concentration of CSAs is not in Craftsbury but in Burlington and Montpelier, both hours away. His excess products he sells wholesale to restaurants and demand comes from as far away as Boston 207 miles away. That is farther than from Emmetsburg to Minneapolis at 200 miles away. Let your imagination run with this opportunity for Soper Farms.